Mobile marketing is such a diverse opportunity in today’s advertising marketplace. If you are not utilising mobile in some way shape or form you are missing out on major response opportunities. Mobile to us is how we can target a user on any device they are using. It can be reading an email (over 50% of emails opened are on a mobile device) downloading an app or some readily available content – video, e-books, anything. 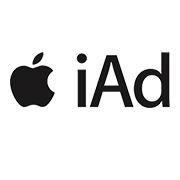 Our experience with Apple’s iAd workbench is second to none here in the AU market. Please contact one of our consultants to show you what you may be missing out.